The garage is more than just a place to store cars. It is a place to work, hang out, and show off the vehicles that are an integral part of car lovers' lifestyles. This lushly illustrated, large-format gift book caters to America's fascination with the garage and looks at 25 of the most incredible garages in the United States. The list of garages compiled by author Phil Berg is a mix of over-the-top garages built by some of the most well-known names in the auto industry, including Ken Gross, Brock Yates, Don Sherman and Bruce Meyer. Amazing garages, from Peter Mullin's fantastic underground garage full of Delahaye roadsters to Jay Leno's three buildings full of vehicles, are featured in full color detail. Phil Berg spent eight years as an editor at Autoweek magazine and ten years as a senior editor at Car and Driver before moving on to a career as a freelance writer for Popular Science, Maxim, Parade, Trips, and many other magazines and newspapers. Berg's words can also be found in new car reviews and driving impressions for web sites such as New Car Test Drive, Autobytel, Truck Trend and The Car Connection. His second book, about the Corvette C6, was published in September 2004. Forbes magazine recently interviewed Berg for a story called "Building the Ultimate Garage." Berg has a soft spot for old VW Beetles, having driven one for many years and many miles in his younger days. He lives near Ann Arbor, Michigan, with his wife and two children. More information can be found at his website: www.philberg.com. We can’t think of a better author for such a book: Berg was a garage rat when he worked at AutoWeek in the ’80s and again when he was at Car and Driver in the ’90s. He has gotten access to some stupendous garages, including those owned by such recognized names as Bob Lutz, Ken Gross, Brock Yates, Pat Ganahl, Don Sherman and Bruce Meyer. Copiously illustrated and lovingly described, these range from over-the-top Garage Mahals to workaday, busted-knuckle places. 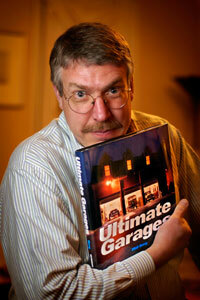 If your garage has a conversation area with a coffee table or bar, this book goes on it. If not, buy it for someone who’s married to a TIG welder and sleeps with a toolbox.